An Exciting Trip to Romantic Paris, The City of Lights. Are you waiting for an opportunity to visit Paris? Then, kick off your tour in style with a joyride under the sea on the world-famous Eurotunnel from London. Travel nearly two hours prior to passing through the immigration and customs areas on the UK side and after the paperwork is over, proceed towards the terminal building outside Folkestone. We are thrilled as our coach drives right inside the train, the Eurotunnel. Also referred to as the Chunnel, with 40 kilometres undersea section and 50 kilometres length, Eurotunnel is the longest undersea tunnel in the world. Eurotunnel Shuttle is the channel tunnel crossing train that runs from Folkestone in the UK to Calais in France. It provides roll-on and roll-off shuttle service for cars, coaches and freight services. You drive on in England, and drive off in France or vice versa!! Once all the passengers and the vehicles are inside, the shuttle is closed securely and you are ready to go!! The train pulls off very smoothly and effortlessly and chugs along and there we are all excitedly entering the tunnel. A slight blocking in our ears as we traverse through the sea makes us realize that we are going under the sea. An electrifying feeling engulfs us! Thirty five minutes on your journey and you are in France. Gradually the train runs in a massive loop to get to the platform area. The terminals (Folkestone and Calais) are organized with the frontier controls juxtaposed with the entry to the system to allow travellers to go onto the motorway at the destination country immediately after leaving the shuttle. The train stops, the doors open, and off you go! It is 7 pm. Suddenly the energy that we thought was lost due to travelling the entire day, bounced back with a vengeance and we are all set to view the iconic Eiffel tower that night. Travelling by metro, a convenient underground labyrinthine system, to Champ de Mars station, and walking to the most awaited Eiffel tower is an electrifying experience. Alight at Champ de Mars station and walk towards the iconic Eiffel tower. No sooner did we walk for 20 minutes, I recall letting out an “ah” .What a sight to behold! The tower crowns the Paris night sky line with its festive light, and sprinkles glittering lights every hour. For all right reasons, Paris is called the "City of Lights”! As symbolic of Paris as pavement cafes, this wonder, representing an elegant and contemporary Paris stands at a whopping 1063 feet high. We leave by the last train at 12 midnight to our hotel and are dead to the world for the next three hours before waking up at 6 am the following day. First visit to Paris can be intimidating as you are sure to stumble upon incredible history and beauty everywhere. Your first trip to Paris is in complete without your visit to the Gothic Notre Dame Cathedral. This is one of the most singular and stunning gothic cathedrals in the world that is centrally located on the Ile de la Cite, an area in Paris that divides the city's right and left banks of River Seine. Its dramatic towers, spire, stained glass and statuary are sure to confound you. Point Zero in the cathedral square contains the point from which all distances in France are officially calculated. Stroll through the narrow and lively streets near the cathedral where you will find dozens of small bistros and lavish restaurants. We grab some French fries and some salad and visit Shakespeare & Co., an old bookstore near the Notre Dame where you can a take a nap if you wish to! Very interesting! tours are conducted. We find that petrol prices there reflect a hefty tax to encourage conservation. This probably explains the large number of ubiquitous motor scooters we see in the streets. Paris comprises of 20 arrondissements (neighbourhoods) and we experience the distinct aura and uniqueness of each one of them. Paris is known for its majestic squares with tall columns and several grand buildings vie for our attention. The Place de la Concorde, the largest public square along river Seine is mind boggling and is home to the pink granite Obelisk of Luxor, a stunning Egyptian icon. A massive traffic circle containing ‘La fontaine des Mers’, with its black and gilded sculptures is at the centre of the plaza. The grandiose Avenue of Champs Elysses, a mile long boulevard, known as “the world’s most beautiful avenue” is a cultural centre and the activities that take place there are unique , not to be found in any other European street. We encounter several tourists and gourmands seeking the latest designed clothes, theatres and five-star cuisines. The 164-foot Arc de Triomphe, at the western end of the Champs-Élysées on the right bank of Seine, is in honor of those who fought for France in the Napoleonic Wars. We are astonished by the size and the craftsmanship of this famous landmark. In the impressive Dôme des Invalides is the notable tomb of Napoleon Bonaparte. You will be surprised to know that it was customary to bury the kings in three parts- the heart, the entrails and the body! In the afternoon, it is time to visit the renowned Louvre museum. Originally a royal palace, The Louvre, is definitely one of Paris' most coveted attractions consisting of the diverse collection of painting, sculpture and decorative objects of pre-20th century. We are bowled over by its immense area and you need a week to explore its exhibits. With limited time you can make a checklist of a few masterpieces including Winged Victory, Mona Lisa, Michelangelo’s Slaves, and just walk past them. The Glass Pyramid, in the courtyard of the museum, spectacular in concept and form, provides a startling reminder of the audacious ability of modern architects to invigorate and re-circulate traditional architectural forms. It is an entrance doorway providing further light and ventilation to the subterranean spaces of the museum. A number of fake painters are seen sitting in the museum’s vicinity, offering paintings at very low prices! Time and again you are warned of thefts in a crowded venue filled with tourists! Seine River cruise: The Seine flowing through the centre of Paris contributes to creating extraordinary vistas of the city. We enjoy an hour long, memorable Seine cruise along the river. 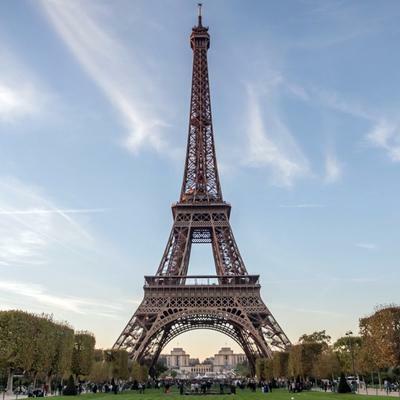 Departing from and returning to Eiffel tower, while seeing some of Paris' most beautiful sites glide past as you drift down the Seine is an awesome experience. With an informative commentary, we get a fresh perspective of the city’s magical monuments in this wonderful cruise. We spot some locals moving around in grey bicycles with Vélib logo printed on them and see several Velib parking lots as well. Vélib is an inexpensive bicycle rental service with stations all over the city. Not only is Vélib a great way to see Paris, but is environment friendly as well. Café society appears to be deeply embedded in French culture. Cafes, bakeries and bistros- large and small, expensive and modest, are found in every neighborhood. The next day morning we leave Paris and continue our European tour to the city of Brussels. The sweet aroma of warm morning bread from a nearby bake shop reminds us of our wonderful stay in Paris. Why did the German general in World War II defy Hitler's order to destroy Paris? Because it is beautiful, romantic and cultural gem of a city!